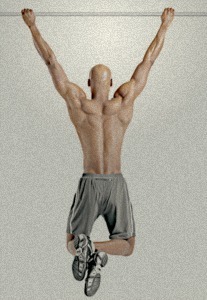 Pull up exercise works a large number of muscles in your back, shoulders, and arms at the same time. Pull up works all of the ‘pull’ muscles in your body - your back, biceps, and forearms. They are indicative of your level of fitness - anybody that can do a pull-up is in pretty good shape. Anybody that can do 10 or more is clearly in great shape. Pull-ups belong to a group of exercises known as closed chain kinetic exercises. They are so called because the arms or the feet are fixed in their position, and it is the body that has to rearrange itself around the fixed point. Other examples of closed chain kinetic exercises include push-ups, squats and stationery lunges. The correct way to initiate a pull-up is to begin by drawing your shoulder blades together as if you are trying to pinch an imaginary pencil between them. Once this is done, go ahead and push your chest through as though someone has grabbed you by the cuffs of your shirt and is yanking you towards the ceiling. These two actions stabilize your shoulder complex and ensure that the workload is directed into your rhomboids and lattissimus dorsi - the main powerhouses of the upper back as opposed to the biceps, which by themselves would be inadequate to hoist up your entire body weight. Many of us find pull-ups very difficult to execute, not because we lack the requisite upper body strength, but simply because we do not initiate the movement by engaging the right muscle groups. Try this and you should find that you enjoy much more success. With initiation out of the way and the right muscle groups engaged, you now need to shift your focus to the follow through. This is the main body of the exercise. It is the phase in which the prime movers kick in. The prime movers are the muscles that do the actual heavy lifting. They are the lattisumus dorsi. Their central function is to draw the upper arm down toward the body. In order to activate them successfully, you need to think of pulling though your elbows and using that leverage to get your chin up and over the bar. This should be a slow controlled movement that should ideally take anything up to four seconds to complete. This is also the point at which technique wins over strength. Your lats, as the lattisumus are referred to in short, are a much larger and powerful muscle group than your biceps. By keeping the lower body relaxed and powerfully engaging the lats, you provide much more torque for the lift than would otherwise be possible from an over-reliance on the biceps. You also want to make sure that you eliminate all momentum so that you are not swinging wildly all over the place as I so often see folks doing at the gym. These are some of the key points that you will have to practice in order to have true mastery of the pull-up. As the name suggests, this simply means getting back to your starting point. Quite often, guys hurl themselves up into the bar and then simply fall back down in a very untidy and jerky movement. Not only does this expose you to the risk of serious shoulder injury, it also negates much of the effectiveness of the movement by taking away what is arguably the most beneficial part of the exercise. It is now widely accepted within the fitness industry that the eccentric or negative part of any strength exercise is the phase from which you derive the greatest gains in both strength and muscle tone. Eccentric training is double effective mainly because the muscle is forced to keep contracting even as it is lengthening. This produces greater adaptations in terms of strength as well as enhanced metabolic (calorie burning) activity. This is useful to anyone looking to shed a few pounds and improve their muscle tone. Also working to your advantage is the fact that you can generally lower more weight in the eccentric phase of the movement than you can lift in a concentric contraction. The short of this is that even if you do not have the strength to lift yourself up into the pull up, you can still use the aid of a chair to go up and focus solely on gently lowering yourself back. Soon enough, you will build up the requisite strength to perform a full pull-up with ease. My work here is done – it’s now up to you to take care of business. No matter your starting point, you CAN do pull up exercise. Follow the path that works for your schedule, your experience, and your level of comfort with this movement - there’s no shame in going slowly and progressing safely.